Yeasts are part of the normal intestinal microflora. 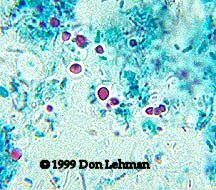 They are round to oval and measure 4-8 µm in diameter and can be confused with some of the smaller intestinal protozoa. On trichrome stain (at right) they stain purple to red and sometimes green. Frequently, budding forms will also be seen.